VANCOUVER, Wash. (AP) — Democrats see new opportunity in a southwest Washington congressional district as the party looks to make gains in a section of this blue state that has been out of reach to them for years. Republican incumbent U.S. Rep. Jaime Herrera Beutler was first elected to the 3rd Congressional District in 2010, and she won her last two elections with more than 60 percent of the vote. But a strong primary showing by Democrat Carolyn Long, a political science professor at Washington State University’s campus in Vancouver, has made the once safe Republican area one of three GOP-held districts in play in this year in the Evergreen State. In Washington’s August primary — in which the top two candidates advance regardless of party — Long trailed Herrera-Beutler by about 7 percentage points, with the incumbent capturing 42 percent of the vote on a crowded ballot of seven total candidates. The combined Republican vote in the race was about 51 percent to the combined Democratic vote of 49 percent, though this week a Republican candidate who had received more than 3 percent of the vote in the primary said he was endorsing Long. “We could sense this was going to be a competitive seat early on,” she said in an interview at her Vancouver campaign office. 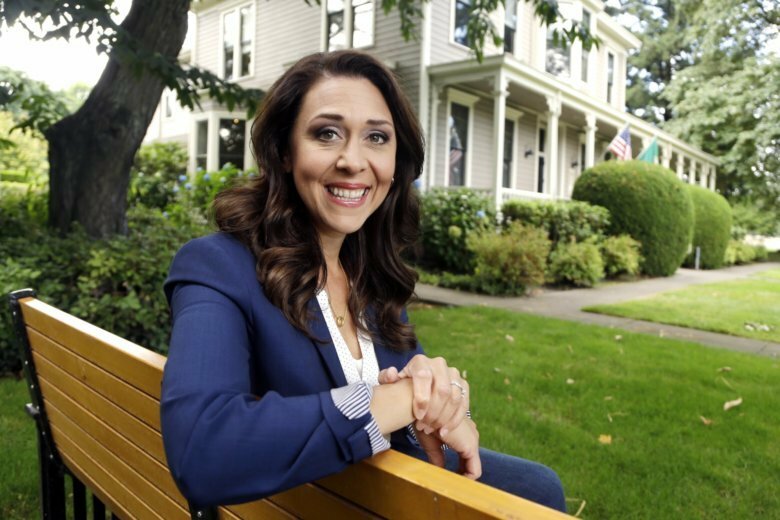 Herrera Beutler said while a more motivated Democratic base might have showed up to the primary, voters in her district trend independent and she remains focused on the November contest. “I’m going to keep working hard, I’m not going to take anything for granted, but I don’t believe the entire district has shifted,” she said. Independent pollster Stuart Elway said the 3rd Congressional District is one where Republicans are playing defense because of President Donald Trump. Trump only garnered 38 percent of the statewide vote in 2016, but won the 3rd District with just under 50 percent of the vote. Washington has 10 congressional districts, the most recent one being added after the 2010 census. The congressional delegation currently has six Democrats and four Republicans. Herrera Beutler was elected before the district’s lines were redrawn. With her 2010 win, Republicans claimed a seat the GOP hadn’t held since 1994. After redistricting took effect with the 2012 elections, the district became more conservative, losing the liberal-leaning state capital of Olympia and expanding farther east. The district — which now retains a sliver of Thurston County — still spans southwest Washington down to Vancouver, west to the Pacific Ocean and east past the Cascade Mountains. Herrera Beutler said while she didn’t vote for Trump (she wrote in House Speaker Paul Ryan) she is cognizant of the fact her district did, and has supported the president on issues she agrees with, like the Republican tax cut and his stance on lowering prescription drug costs. But she notes she’s also stood against the administration, including speaking out against the idea of drilling off the coast of Oregon and Washington. “I’ve always worked to reflect the district,” she said. Voter Dale Merten, vice president and chief operating officer of a local telecom internet provider in Toledo, Washington, said he admires Herrera Beutler’s support of small businesses and rural communities. He cited her support of the tax cut as an example she’s more in line with the district than Long. If elected, she said the first thing she would do is join bipartisan efforts to stabilize the Affordable Care Act. Long said her husband, a Republican who voted for Trump, hasn’t yet said if he’ll vote for her. “He wants to see my platform,” she joked. Long didn’t find that unusual, and said their 13-year-old daughter has only benefited from seeing what diplomatic political conversations look like.